Clare PPN made one general submission to the Draft Regional Economic and Spatial Strategy and one which was drafted by our member Clare Women’s Network which dealt specifically with the position of women in relation to the Draft Strategy. We wish to thank all of those who provided input to our submissions. We’ll keep an eye out for any updates and keep you posted on them. Given the experience to date in the operation of PPNs, it is now considered necessary, by both the Department and the National Advisory Group, to review the content of the User Guide to ensure it properly captures the range of issues impacting on the operation of PPNs and is fit for purpose in terms of supporting the on-going growth and development of PPNs. Please note: This is not a review of the PPNs. As a first step, it has been decided to consult with all stakeholders in relation to the current User Guide and obtain their views on how a future guide/handbook might assist stakeholders with a concise resource of information that informs, guides and instructs in a user friendly way that is understood by all users. The closing date for receipt of submissions is 3pm on 30 April 2019. 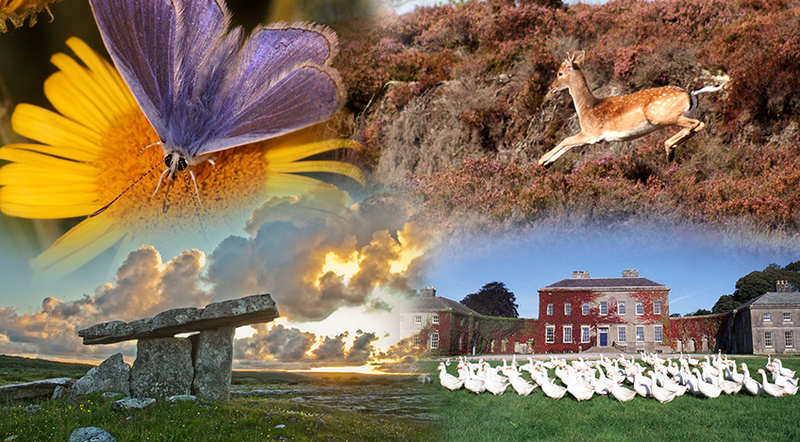 Clare County Council is inviting local communities as well as project and housing estate committees to build on the county’s strong track record of success in the IPB Pride of Place Competition by putting their name forward to take part in 2019. Clare has enjoyed considerable success in the all-island competition during recent years with main category wins for Shannon in 2018, Doonbeg in 2015 and Miltown Malbay in 2013. The annual awards programme, which is run by Co-operation Ireland in conjunction with local authorities North and South, aims to recognise and celebrate the vital contributions that communities make to society along with generating awareness, respect and inclusion for every facet of society. Clare County Council is inviting expressions of interest from local communities, projects or housing estates who wish to seek nomination to the IPB Pride of Place 2019. In late April, the Local Authority will nominate one group per competition category, providing the total number nominated does not exceed five. Judging for Pride of Place 2019 takes place between June and August with winners, runners up and special award recipients receiving a trophy and a small monetary prize at an awards ceremony on 30th November in the Lyrath Estate Hotel, Kilkenny. There are twelve categories under which communities can enter. They include four themes, namely Community Wellbeing Initiative, Creative Place Initiative, Age Friendly Initiative and Community Tourism Initiative, along with five population categories for locations with less than 300 people; 300-1000 people; 1,000-2,000 people; 2,000-5,000 people and more than 5,000 people. The remaining categories are Housing Estates, Urban Neighbourhoods, and Islands and Coastal Communities. Groups interested in being considered for nomination are asked to submit a written expression of interest, detailing their preferred Category with a one page typed summary (no more than 150 words) setting out their proposal to: Nicola Killeen, Pride of Place Coordinator, Rural and Community Department, Rural Development Directorate, Clare County Council, New Road, Ennis, Co Clare. The Expressions of Interest will be assessed, per category, based on the Co-Operation Ireland criteria (attached) and at www.prideofplace.ie. Closing date for receipt of expression of interests is 4.00pm on Friday, 29th March, 2019. Clare Public Participation Network, Clare Volunteer Centre and Clare Local Development Company invite those involved with community groups, charities or non governmental organisations in Clare to attend one of two introductory workshops on Governance and the Charities Governance Code which will take place on March 21st 2019 from 2.00pm to 5.00pm and will be repeated from 6.30 to 9.30pm on the same day. A further follow up workshop will take place on April 17th 2019 to assist groups with any issues they may have. This workshop will be advertised at a later date. Why Governance and the Charities Governance Code? Our three organisations have collaborated to organise these workshops in response to a demand from the groups we have consulted with over the last year who all identified governance and regulation as the main issue they struggle with. We hope that these introductory level workshops will help community groups to gain an understanding of what is expected of them and assist them with identifying areas where further training might be necessary. Good governance involves putting in place systems and processes to ensure that your organisation or charity achieves its objectives with integrity and is managed in an effective, efficient, accountable and transparent way. This training will give an overview of governance and the Charities Governance Code, helping organisations and charities get a handle on what further training or support they may need in this area. If your organisation has any trouble with the cost or is unable to make the payment online please contact 087 1617375 or admin@clareppn.ie and we will make alternative arrangements for you. .
We have contracted the Charmicael Centre in Dublin to deliver this training and the sessions will be conducted by Caroline Egan of Cramden Tech who is Managing Director of Shannon based training and eLearning company, CramdenTECH Ltd. She has almost 20 years experience in the non-profit sector. Her areas of training expertise include corporate governance and compliance, charity management, social enterprise development, business planning, strategic management and communications. 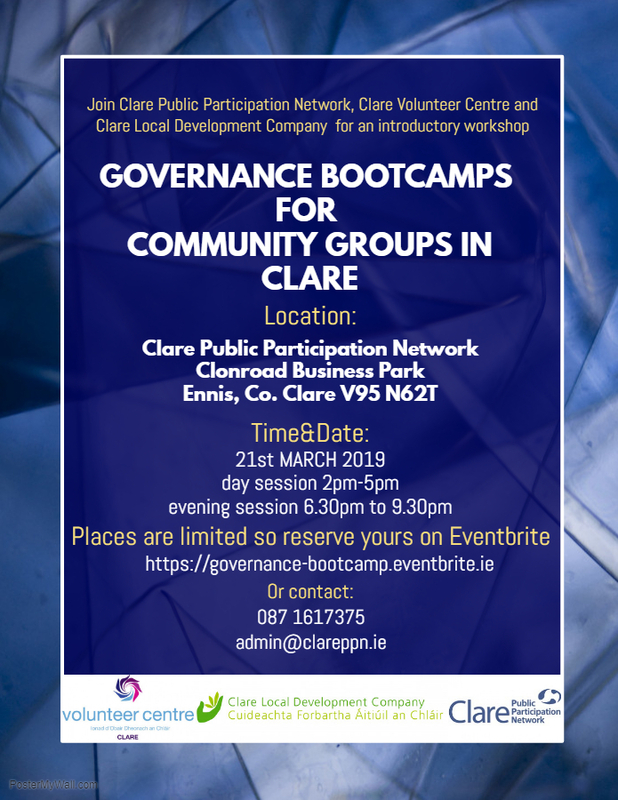 Clare PPN, Clare Volunteer Centre and CLDC’s SICAP programme are working together on these events to make the best use of resources available to Community Groups in Clare. A meeting took place on 9th February with Clare Leader Forum and University of Limerick and facilitated by Dr. Rosie McGowran. Below please find the presentation slides and also some publications from the National Disability Authority. This Code of Practice on accessibility of public services and information provided by public bodies has been prepared by the NDA, at the request of the Minister for Justice, Equality and Law Reform, under the provisions of the Disability Act 2005 (the Act) (Part 3, Section 30). This Code of Practice has been declared by order an approved code of practice for the purposes of the Disability Act, 2005. S.I. No. 163 of 2006 refers and is entitled “Disability Act 2005 (Code of Practice) (Declaration) Order 2006”. This report was commissioned by the National Disability Authority and produced by Interactions Ltd. The National Disability Authority has commissioned and funded this research. Responsibility for the research (including any errors or omissions) remains with Interactions Ltd. The views and opinions contained in this report are those of the authors, or the reported views of the people who took part in the consultation, and do not necessarily reflect the views of the National Disability Authority. The plan seeks to recognise the vital role heritage plays in our community, our economy and our society and the Department of Culture, Heritage and the Gaeltacht is inviting the public’s views to help shape the priorities for Ireland’s heritage for the next 10 years. In order to facilitate the Heritage 2030 process, Clare PPN and Heritage Office held an open public consultation session at the Clare PPN Offices, Tuesday 26th February. In order to make it easy for people to have their views heard Clare PPN is preparing a joint submission based on this meeting and on written submissions we have also received.